Objective To determine if the comparison of acute and chronic workload is associated with increased injury risk in elite cricket fast bowlers. Methods Data were collected from 28 fast bowlers who completed a total of 43 individual seasons over a 6-year period. Workloads were estimated by summarising the total number of balls bowled per week (external workload), and by multiplying the session rating of perceived exertion by the session duration (internal workload). One-week data (acute workload), together with 4-week rolling average data (chronic workload), were calculated for external and internal workloads. The size of the acute workload in relation to the chronic workload provided either a negative or positive training-stress balance. Results A negative training-stress balance was associated with an increased risk of injury in the week after exposure, for internal workload (relative risk (RR)=2.2 (CI 1.91 to 2.53), p=0.009), and external workload (RR=2.1 (CI 1.81 to 2.44), p=0.01). Fast bowlers with an internal workload training-stress balance of greater than 200% had a RR of injury of 4.5 (CI 3.43 to 5.90, p=0.009) compared with those with a training-stress balance between 50% and 99%. Fast bowlers with an external workload training-stress balance of more than 200% had a RR of injury of 3.3 (CI 1.50 to 7.25, p=0.033) in comparison to fast bowlers with an external workload training-stress balance between 50% and 99%. Conclusions These findings demonstrate that large increases in acute workload are associated with increased injury risk in elite cricket fast bowlers. Compared with players in other positions, the higher absolute workload of fast bowlers is also associated with greater injury rates. Over a period of 10 Australian cricket seasons (2001–2011), fast bowlers, batsmen, wicketkeepers and spin bowlers recorded injury rates of 18%, 7%, 4% and 6%, respectively.6 A survey of all West Indian cricket matches between June 2003 and December 2004 concluded that 40% of all injuries were sustained by fast bowlers and that fast bowlers missed a combined total of more than 234 days of play due to injury.7 Similar research in South African cricket has shown that 33% of all injuries over a 3-year period were sustained by fast bowlers.8 It is clear that the performances of international and domestic cricket teams have been hindered due to the high injury rates sustained by fast bowlers. Relationships between fast bowling workloads and injury have been reported previously in first-class cricketers.5 ,9 Often, these relationships are determined based on the number of balls bowled in a week and the likelihood of injury within that week. However, a delay of up to 3–4 weeks between high workloads and increased injury risk in fast bowlers has been documented.5 The 14-day, 21-day and 28-day periods following bowling volumes of greater than 50 overs in a match showed injury risks of 9%, 13% and 16%, respectively.5 Moreover, when bowling volumes were greater than 30 overs in the second innings of a multiple day match, the risk of injury rose to 22% during the 28-day period following the match.5 While the total workload on the bowler was not included in this study (ie, no training data were included in the analysis), the results clearly demonstrate that there is a delay in the increased risk of injury following high workloads. In a more comprehensive analysis of workloads, which did include training deliveries, relationships were found between bowling volumes and risk of injury.9 Interestingly, this research suggests a ‘window’ of deliveries (between 123 and 188 deliveries per week) where fast bowlers have decreased likelihood of injury within the week that the bowling volume occurs. The average weekly bowling volumes below (relative risk (RR)=1.4) and above (RR=1.4) this ‘window’ show an increased risk of injury.9 Furthermore, in the same study, it was demonstrated that bowlers with an average of less than 2 days (RR=2.4) or more than 5 days between bowling sessions (RR=1.8) were at a significantly increased risk of injury than bowlers with an average of 3–4 days between bowling sessions.9 These results suggest that underbowling and overbowling may increase the risk of injury. The analysis of bowling volumes by counting balls bowled in isolation does not encompass other aspects that produce total workload, such as fielding, batting and other conditioning requirements. Furthermore, links between perceived effort (which can encompass all aspects of training) and injury have been established in other sports.10–13 However, until now, no study has investigated the relationship between external (eg, bowling volumes) and internal (eg, perception of effort) measures of workload, or the relationship between internal measures of workload and injury in elite cricket fast bowlers. Estimates of workload are often referred to in absolute terms (ie, the amount of work the athlete has performed in a week)10–12 or in simple relative terms (ie, the amount of work the athlete performed this week compared with last week).13 However, no study has assessed whether comparing what an athlete has performed in a week (acute workload) with what the athlete has been prepared for (chronic workload) is an appropriate model for evaluating workload and predicting injury. Previous studies have assessed a model designed to predict ‘performance’ by comparing acute and chronic workloads.14–16 In this model where performance is estimated as ‘fitness’ minus ‘fatigue’, the chronic workload represents a marker of ‘fitness’, while the acute workload represents a marker of ‘fatigue’. The difference between the positive function of fitness and the negative function of fatigue provides either a positive (ie, chronic workload is above the acute workload) or negative (ie, acute workload is above the chronic workload) training-stress balance. Therefore, the purpose of this study was to determine if the assessment of internal and external workload and the comparison of acute and chronic workload is associated with subsequent injury in elite cricket fast bowlers. The sample comprised all 28 fast bowlers (mean±SD age, 26±5 years) that were contracted to either the New South Wales (NSW) or Victorian cricket squad between 2006 and 2012. Data were collected over five Australian domestic cricket seasons (preseason through competition phase); of those five seasons, 11% (3) of the participants played three seasons, 33% (9) played two seasons and 57% (16) played one season—equating to 43 individual seasons of cricket in total. Injury reports were updated and maintained by medical staff from NSW and Victoria. An injury was defined as any non-contact injury that resulted in a loss of either match-time or greater than one training session over a 1-week period. All ‘soreness’ reported by players was excluded from the analysis. Data were categorised into weekly blocks running from Monday to Sunday. A fast bowler who performed no external or internal work (ie, 0 balls bowled or 0 arbitrary units) would not have produced a workload and therefore not have produced a risk of injury due to overload. However, these data were included in the analysis—in order to give insight into the risk of injury in the week following no work. One-week data, together with 4-week rolling average data, were calculated for external and internal workloads. The 1-week data represented the acute workload (ie, ‘fatigue’), while the 4-week rolling average represented the chronic workload (ie, ‘fitness’). Training-stress balance ranges (expressed as a percentage) were calculated by dividing the acute workload by the chronic workload. Weekly workloads that were below 1 SD for the individual's chronic workloads were removed from the analysis. This was performed so that the analysis would not consider small absolute increases of acute workload at low chronic workloads (ie, if a fast bowler had a chronic external workload of six deliveries, a 300% increase would be an acute workload of 18 deliveries). This could be considered a low increase in absolute workload (12 deliveries); however, it would be expressed as a highly negative training-stress balance (300%). Data were categorised into discrete ranges based on the total number of balls bowled and the internal workload performed per week. Internal workload ranges were divided into 500 arbitrary unit increments. In this respect, 500 arbitrary units of internal workload represented approximately one hard session of training. External workloads were divided into five-over increments (ie, increments of 30 balls bowled). Injury likelihoods were calculated based on the total number of injuries sustained relative to the total number of players exposed to the workload. Injury likelihoods were calculated for the present week (ie, the week in which the workload was performed) and the following week. The likelihood of sustaining injury was analysed using a logistic regression model, with injury as the dependent variable, and acute and chronic workloads for internal and external workloads as the predictor variables. Additional predictor variables included the training-stress balance for internal and external workloads. RR and 95% CI were calculated to determine which workload variables increased or decreased the risk of injury. A value greater or less than 1 implied an increased or decreased risk of injury, respectively. A summary of descriptive statistics for all participants’ workload variables over the duration of the study is shown in table 1. The relationships between injury risk and acute and chronic external workloads are shown in figure 1A,B, respectively. There was a relationship (p=0.0001) between acute external workloads in the current week and injury, with higher external workloads associated with a lower injury risk. No relationship (p=0.172) was found between acute external workloads and injury in the subsequent week. The relationships between higher chronic external workloads in the current week (p=0.002) and subsequent week (p=0.017) were associated with lower injury likelihoods. 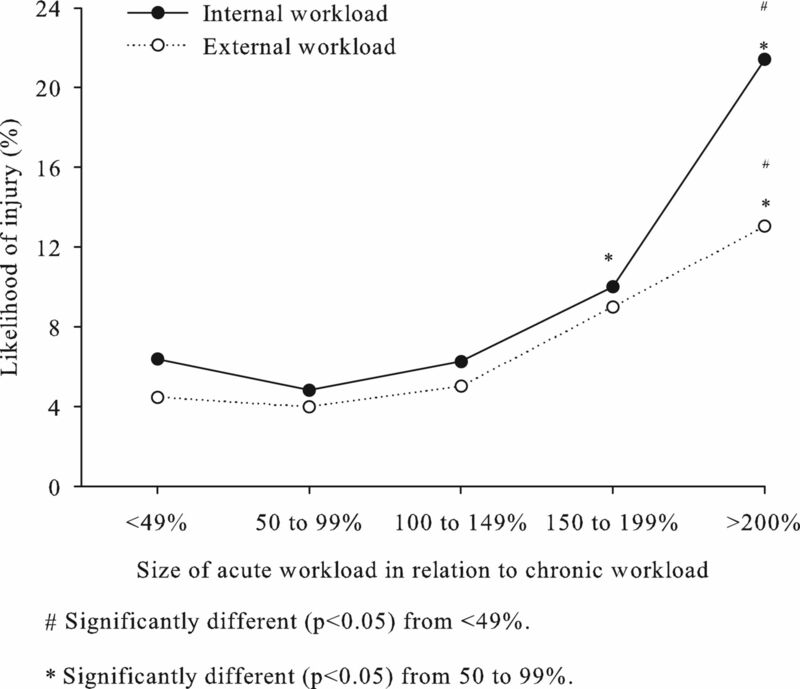 Likelihood of injury at acute (A) and chronic (B) external workloads, and acute (C) and chronic (D) internal workloads. 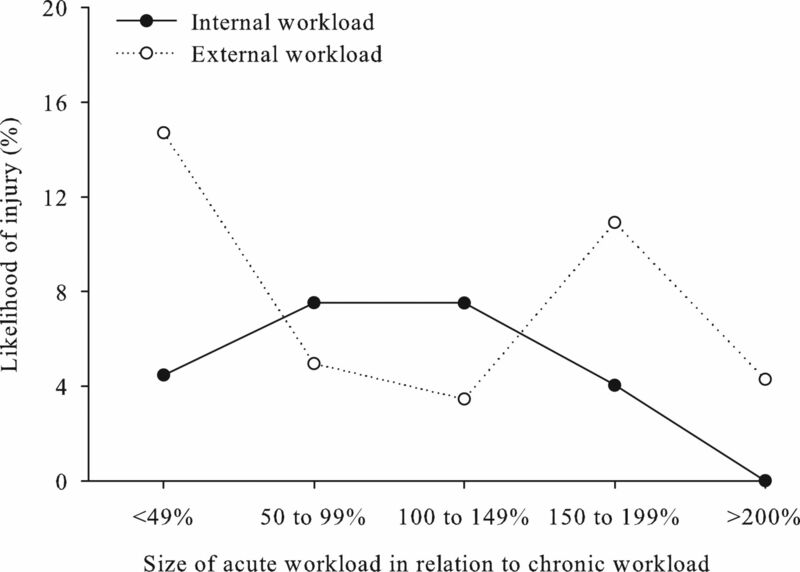 The likelihood of injury in response to acute and chronic internal workloads is shown in figure 1C,D, respectively. No relationships were found between either acute (p=0.176) or chronic (p=0.210) internal workloads and injury in the current week, or between acute (p=0.109) or chronic (p=0.381) internal workloads and injury in the subsequent week. Figure 2 shows the likelihood of injury at positive and negative training-stress balance ranges in the current week. No relationship was found between injury and internal workload training-stress balance (p=0.230), or injury and the training-stress balance for external workload (p=0.556) in the week that the training-stress balance was measured. Likelihood of injury in the current week for positive and negative training-stress balance ranges. In relation to the external workload, a negative training-stress balance was associated with an increased risk of injury (RR=2.1 (CI 1.81 to 2.44), p=0.01) in the following week. Negative training-stress balance accounted for 51% (322) of all recorded training-stress balance ranges. Sixty-three per cent (22) of all injuries occurred 1 week after a negative training-stress balance. Bowlers with an acute workload of more than 200% compared with chronic workload had relative injury risks of 3.3 (CI 1.50 to 7.25, p=0.033) and 2.9 (CI 1.14 to 7.40, p=0.044) in comparison to players with a training-stress balance between 50–99% and less than 49%, respectively (figure 3). Likelihood of injury in the subsequent week for positive and negative training-stress balance ranges. In the subsequent week, a negative training-stress balance for internal workload was associated with an increased risk of injury (RR=2.2 (CI 1.91 to 2.53), p=0.009). Negative training-stress balance accounted for 47% (344) of all recorded training-stress balance ranges. Fifty-seven per cent (27) of all injuries occurred 1 week after a negative training-stress balance. Fast bowlers with an internal workload training-stress balance of greater than 200% had a RR of injury of 4.5 (CI 3.43 to 5.90, p=0.009) and 3.4 (CI 1.56 to 7.43, p=0.032) compared with those with a training-stress balance between 50–99% and 0–49%, respectively. Additionally, fast bowlers with an internal workload training-stress balance between 150% and 199% had a RR of injury of 2.1 (CI 1.25 to 3.53, p=0.035) in comparison to fast bowlers with a training-stress balance between 50% and 99% (figure 3). This is the first study to investigate the relationship between acute and chronic workloads and injury risk in elite cricket fast bowlers. We used a performance model14–16 that has previously been described to quantitatively estimate the training preparedness of an athlete by calculating the difference between chronic workload (ie, fitness) and acute workload (ie, fatigue).16 While Banister et al16 stated that preparedness for competition grows as the chronic workload outweighs the acute workload, our results indicate that injury risk increases as the acute workload outweighs the chronic workload. Furthermore, the greater the increase in acute workload relative to chronic workload, the larger the increase in injury risk in the following week. This is highlighted by the threefold and fourfold rises in injury risk for external and internal workloads, respectively, when the training-stress balance exceeded 200%. These findings demonstrate that sudden increases in workload, above which fast bowlers are accustomed, increase the likelihood of injury in the following 1-week period. The present study also highlights that greater external workloads over a 1-week and a 4-week period results in a decreased risk of injury during the week of exposure. However, the relationship between greater acute external workloads and lower injury risk in the current week may not necessarily be causal. That is, injuries may occur due to a myriad of factors that are unrelated to training or competition workloads.2–4 ,18 ,19 Indeed, it is possible that fast bowlers sustained an injury, and as a result of that injury, recorded a lower external workload in the current week. The results showing that higher chronic external workload produced a lower injury risk could corroborate our findings in relation to the 1-week delay in injury risk after a negative training-stress balance. That is, higher external workloads over a chronic period are likely to result in positive physical adaptations,14–16 potentially minimising the influence of fatigue and therefore reducing the risk of injury. 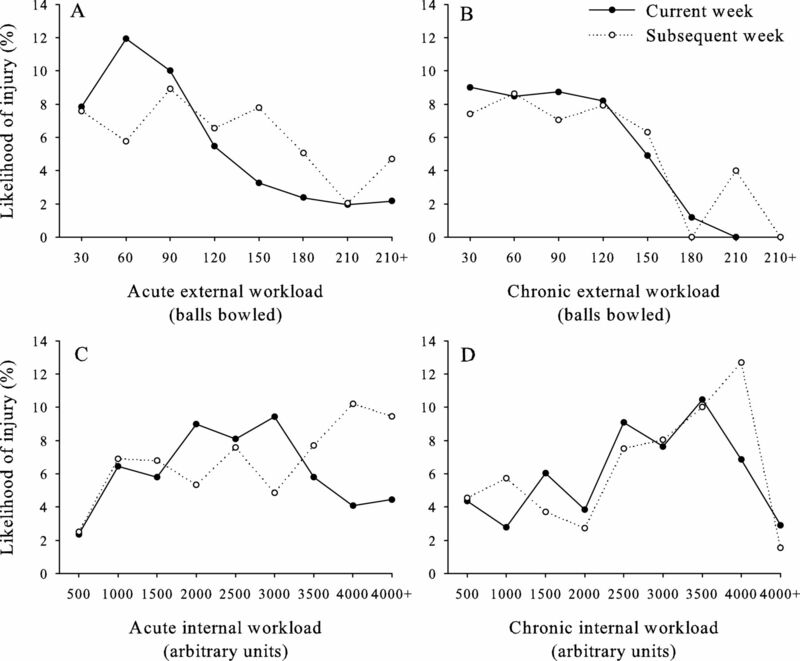 Our findings suggest that increases in chronic workloads should be performed systematically, in an appropriate sequence and combination.20 However, this could be challenging, given that cricket is scheduled with extended periods of 20-over cricket, which elicits the lowest workload.1 These low workloads possibly make it difficult for fast bowlers to attain sufficient chronic external workloads to promote the positive physical adaptations required to tolerate the physical demands of multiple day cricket.1 Future studies should assess the time of season at which injury rates are highest to see whether sudden changes in the format of cricket (ie, 20-over to multiple day cricket) are associated with increased injury risk. Our results demonstrate that the monitoring of acute and chronic workloads can offer valuable insight into the likelihood of injury. However, viewing either acute or chronic workloads in isolation does not seem to be as valuable as comparing the workload to which an athlete is accustomed, to the workload to which that athlete has been subjected (ie, the training-stress balance). Although the current study opted for acute and chronic workloads of 1 and 4 weeks, respectively, the most appropriate and valid method of developing a training-stress balance is still unknown. Given that periodisation models have traditionally used 1-week microcycles and 4-week mesocycles,20–24 it could be argued that this arbitrary method is the most convenient way for coaching, conditioning and sports medicine staff. While previous studies have investigated the relationship between injury and external workloads, such as the amount of training9 and competition5 ,9 deliveries that a fast bowler performs, this study is the first to display a link between internal workloads and injury in cricket fast bowlers, although internal workloads were only significant when viewed as a training-stress balance. Internal workload also encompasses all aspects of training and competition, such as conditioning and fielding requirements, perhaps explaining the higher training-stress balance injury likelihood compared with external workload. In addition to this, there is a component of the internal workload that measures an athlete's response to a given amount of work (RPE). This may result in an uncoupling of the internal workload from the external workload (eg, if a bowler manages the external workload well (low RPE), this may result in a lower injury risk than if the bowler does not cope with the same external workload (high RPE)). Therefore, coaches and medical staff should gather information on the internal and external measures of workload in order to gain insight into the likelihood of injury, as well as the preparedness of elite cricket fast bowlers. The training-stress balance for internal and external workloads revealed few relationships in the current week, with injury risk being lowest at training-stress balances of greater than 200% for internal workload and 100–149% for external workload. These results may be of importance when fast bowlers are placed in match situations that require a high workload. Provided that bowlers are not suffering from residual fatigue incurred during the previous week, high workloads resulting in high fatigue may be achieved with minimal injury risk. However, the 1-week delay in injury risk that this high fatigue produces leaves that particular bowler exposed to injury at a later date. Future research should investigate appropriate recovery strategies after high fatigue, which could reduce delayed injury risk. In summary, we investigated the relationship between internal and external workloads and injury risk in elite cricket fast bowlers. We extend upon the work of others,5 ,9 and the understanding of external workloads and injury risk, by also applying an accepted performance model16 in a novel fashion. The results of this study demonstrate that a high chronic external workload is protective of injury. Our results also demonstrate that injury risk increases significantly in the week following sharp increases in acute workload. Furthermore, the monitoring and comparison of acute and chronic workloads can offer valuable insight into the likelihood of injury. It is clear that a negative internal and external training-stress balance is associated with subsequent injury, which highlights the importance of monitoring internal and external workloads and acute and chronic workloads to minimise the risk of injury in elite cricket fast bowlers. Elite cricket fast bowlers have an increased risk of injury in the week following a negative training-stress balance. Greater increases in acute workload relative to chronic workload lead to greater injury likelihoods. Higher external workloads over acute and chronic periods are associated with a reduced risk of injury. How might this impact on clinical practice in the near future? Increases in chronic workloads must be performed systematically, in an appropriate sequence and combination, in order to reduce injury likelihoods. Acute and chronic workloads must be monitored and compared, as the training-stress balance is associated with increased injury risk in elite cricket fast bowlers. Data pertaining to external and internal workloads should be gathered and modelled as a training-stress balance. Adequate recovery strategies must be implemented in the subsequent week to workloads that elicit high fatigue.
. Movement patterns in cricket vary by both position and game format. J Sports Sci 2010;28:45–52.
. Technique factors related to ball release speed and trunk injuries in high performance cricket fast bowlers. Sport Biomech 2004;3:263–83.
. The relationship between bowling action classification and three-dimensional lower trunk motion in fast bowlers in cricket. J Sport Sci 2008;26:267–76.
. The influence of cricket fast bowlers’ front leg technique on peak ground reaction forces. J Sport Sci 2013;31:434–41.
. Fast bowlers in cricket demonstrate up to 3- to 4-week delay between high workloads and increased risk of injury. Am J Sports Med 2009;37:1186–92.
. Injury report 2011: Cricket Australia. Sport Health 2011;29:16–29.
. Injuries in West Indies cricket 2003–2004. Br J Sports Med 2006;40:119–23.
. Cricket injuries: a longitudinal study of the nature of injuries to South African cricketers. Br J Sports Med 2003;37:250–3.
. Bowling workload and the risk of injury in elite cricket fast bowlers. J Sci Med Sport 2003;6:359–67.
. Reductions in pre-season training loads reduce training injury rates in rugby league players. Br J Sports Med 2004;38:743–9.
. Risk factors for injury in sub-elite rugby league players. Am J Sports Med 2005;33:428–34.
. Relationship between training load and injury in professional rugby league players. J Sci Med Sport 2011;14:204–9.
. A systems model of training for athletic performance. Aust J Sport Med 1975;7:57–61.
. Planning for future performance: implications for long term training. Can J Appl Sport Sci 1980;5:170–6.
. Modeling the training response in athletes. In: Landers DM. ed. The 1984 Olympic Scientific Congress Proceedings. Sport and Elite Performers. Champaign, IL: Human Kinetics, 1986:7–23.
. A new approach to monitoring exercise training. J Strength Cond Res 2001;15:109–15.
. Risk factors for lower extremity muscle injury in professional soccer: the UEFA injury study. Am J Sports Med 2012;41:327–35.
. Lumbar stress injuries in fast bowlers: a review of prevalence and risk factors. Phys Ther Sport 2012;13:45–52.
. Periodization strategies. Strength Cond J 2003;25:19–37.
. Periodization: effects of manipulating volume and intensity. Part 1. Strength Cond J 1999;21:56–62.
. Periodization: effects of manipulating volume and intensity. Part 2. Strength Cond J 1999;21:54–60.
. The fitness-fatigue model revisited: implications for long term training. Strength Cond J 2003;25:42–51.
. New horizons for the methodology and physiology of training periodization. Sports Med 2010;40:189–206. Contributors TJG and PB undertook the planning for this project, with advice from JWO. Data were collected and entered by PC and DB. BTH was responsible for additional data entry and data analysis. Responsibility for the content of this paper lies with BTH, TJG and PB. Funding This work was supported and funded by Cricket Australia.